Discussion in 'General Chat' started by karkus30, Jan 4, 2007. So I thought. Wonder if I can get something to get me up when its going to be good weather. I dont mind getting up early and even in the dark if I know it's going to be fine for a few hours. But Im hanged if Im going to get up early every week end just to be dissappointed. Yeah, Im lazy, so what. I found several sites selling weather stations such as skyview, but I really dont need half the gizmos that come with them.........I certainly am not going to log the data or anything like that. I have also emailed a few of the sites but have received no replies.........typical of most small businesses that run ecommerce sites with their standard businesses. Chaps Im bumping this up as I am starting to get older and the less time I spend lying in bed while the weather is good the better.........someone must know something about this ?? 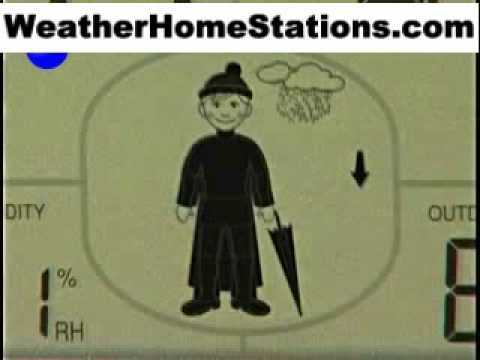 The forums here have a forum on weather stations and such stuff. It's also a good site if you have an interest in things meteorological. Have a cow in the bedroom, if it's lying down it's gonna rain, so stay in bed. Sorry couldn't resist. Sonics finds seem good. it is probably raining really hard. especially if you expect bad weather. Thanks for the help people. I am after a tad more guidance though. Its usually me that does the research on anything and everything, but on this I am drawing a blank. I dont want to be woken up to find its as windy as hell, so cold it freezes my tongue to my lips, pouring down already or ready to start in an hour, drizzling all day. I can see what is offered on various sites, but unlike deciding to buy a projector/MP3 player etc it is really hard to find what is the best thing to buy. Some of the high end kit is getting on for £1000 ! Just thought i'd reignite a 4 year old thread. Mum is after an indoor weather clock something along the lines of this or this. Not really a question about their reliability but more about the positioning of the outdoor sensors that they come with. Does anyone know if they are wall mountable or are they expected to be kept somewhere like a shed or garage. I know that would defeat the object of getting an "outdoor" reading but wasnt sure how they would respond if exposed to the elements. Not looking at anything more than about £50-00 and if it displays external humidity too then thats a bonus! They will work outdoors but why don't you ask the seller or manufacturer about how the sensors mount? The thermo/hydrometer sensor is best mounted on a north facing wall under an eave where it won't get direct sunlight or normal rain falling on it. The temp sensor/humidistat on mine is mounted at the rear of the house which is North facing. We have old Victorian sash windows so mine just sits on the external reveal of the window so it gets some protection from rain but it's not exactly dry. Been up there for a couple of years now with no problems except one battery change. I would recommend the cresta radio linked system. You can buy a full kit or just add when required. Love mine. Combined with a weather App I'm better than the weatherman.